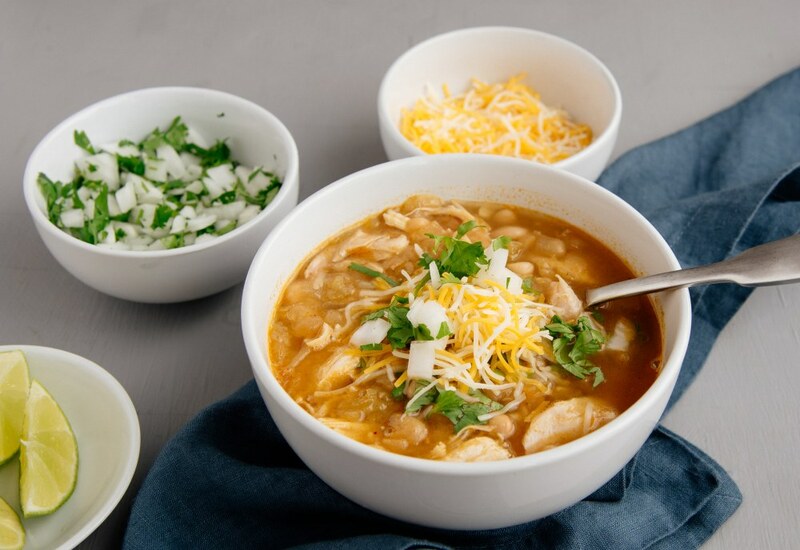 Think of this white bean chicken chili as the lighter, healthier cousin to the standard beef chili. Plus, the recipe is so quick, you can make it on any weeknight. It boasts a short ingredient list and still tastes complex. That's thanks to flavor bomb components, like the canned chiles and ancho chile powder. Delicious and soul satisfying, this dish will warm you up during those colder months. Yet it's not so heavy that you need a nap afterwards. Craving more heat for your chili? Spice it up by adding 1/4 teaspoon cayenne pepper or some fresh sliced jalapeños. Or try a combo of both! But definitely taste as you go. Per Serving: 252 calories; 9g fat; 21.1g carbohydrates; 23g protein; 58mg cholesterol; 564mg sodium. Easy, tasty, healthy - even the kids enjoy it. To make this recipe even quicker, I used a taco seasoning packet. Top with lime-enhanced sour cream and cilantro - but only if you have extra time, as it doesn't need it. If you have tortilla chip crumbs, throw those on top to add a little salty crunch! Hard to be mad a a chili you can have ready this quickly. I liked using the Ancho powder. Seemed to give a boost in replacing the longer stewing time you normally use for chili. Definitely have this in your arsenal for using those rotisserie chickens to make quick dinners. So quick, so easy! I usually get chicken chili from a fast food restaurant our here on the west coast, but this recipe will have me dropping that. Th green chilies are great, but not enough heat for me, so the cayenne steps in nicely. Some tortilla strips added to the top gives a great crunch to this chili. Sry easy and super delicious! If you're looking for a quick, light, and healthy chili, this recipe is perfect. I added a diced jalapeño for extra spice and two cans of green chilies. Cheese is totally optional, but I added a ton. So yummy! Love love love this recipe! Super easy to make, and crazy delicious. I did add a tough of chili garlic paste, but that's it. Definitely recommend to the entire world. I didn’t have any chicken broth or Ancho Chili Pepper so I used turkey broth and chipotle chili pepper. It was still great!